1. On the NYC subway there are signs everywhere that say that if there is an emergency, you should contact the train operator. But they don’t say how to do that. There doesn’t seem to be a communication system on the train (like on Chicago’s trains where there is an intercom type system and each train has a way to talk to the conductor) and when you are underground, there is no cell service - so what do you do in an emergency? 2. Why don’t shoe manufacturers make shoes with some grip/traction? Particularly for shoes meant for poor weather. I wore my chelsea rain boots yesterday and was slipping everywhere because there was a bit of snow yesterday, and it stuck in some places and made for a slippery walk. I considered wearing my sneakers that are super comfy and that I really like - but they have no traction either. What shoes do people wear when it is snowing, but is not snowy enough for snow boots? 3. Why don’t clothing manufacturers prioritize fabrics that don’t pick up lint and pet hair? More people have pets than not - and it is such a huge pain to get something you like that is black and then find it is a cat hair magnet. 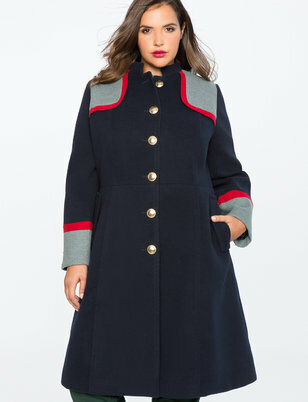 I got a cute new coat from eloquii on super sale (marked down to 40 from almost 200) - and I haven’t even worn it, but it is covered in cat hair. (I also got this coat - also around $40 - love it!). I will likely add more - these were just the ones burbling around my brain this morning. Feel free to add things you find incomprehensible.